Having toddlers means ordering in is just easier than going out, sometimes. When we first moved here, we tried all the local pizza delivery options. We didn't really like any of them. In fact, our favorite is Dominos, if that tells you anything about the quality of the pizza here. 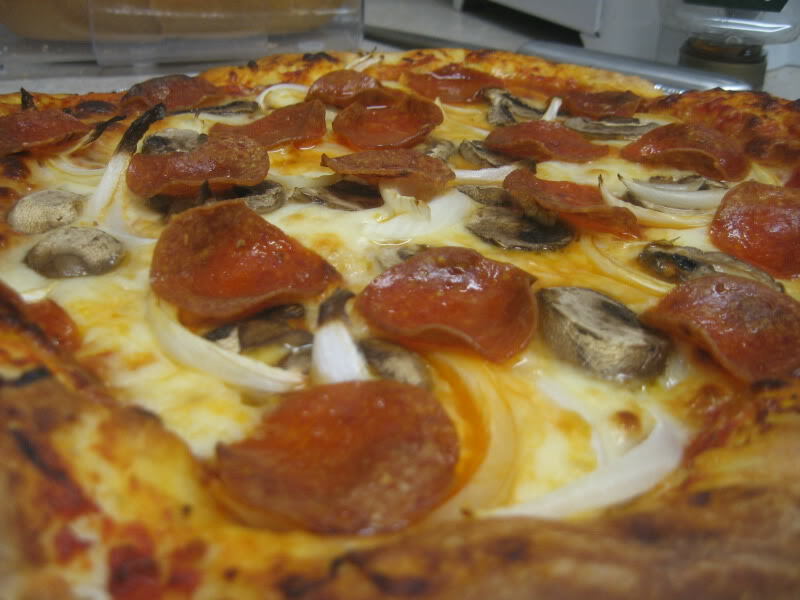 One day, I had the excellent idea of picking up premade pizza dough from Publix. That was a game-changer. I don't make my own dough because that sounds like something I could really mess up, but if you are a better cook than I am, consider it. Otherwise, when you're cruising the bakery section of your local grocery store, pick up a wad of dough. It's worth it. You can use anything as a topping on a pizza. Leftover night will never be the same. My first attempt was your average pepperoni, onion, mushroom pie. Buy a pizza pan. They're cheap. 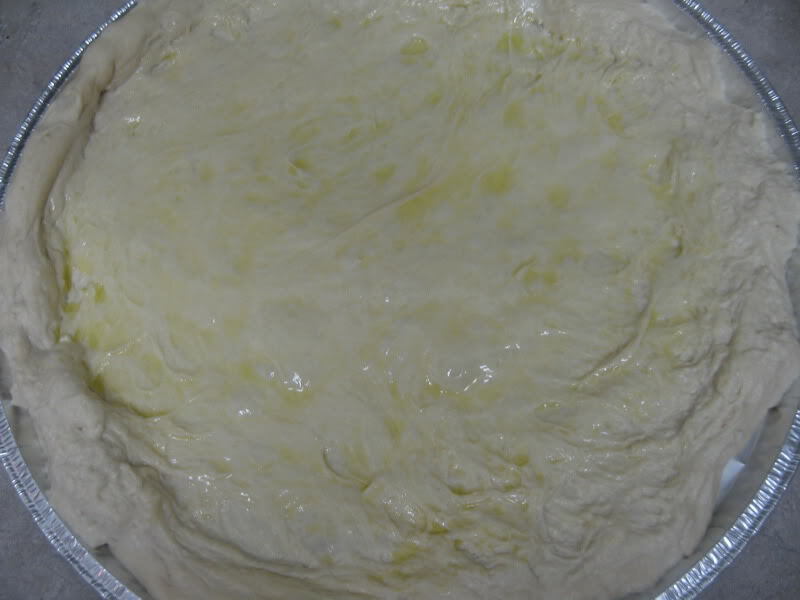 Spread the dough as evenly as you can over the pan. 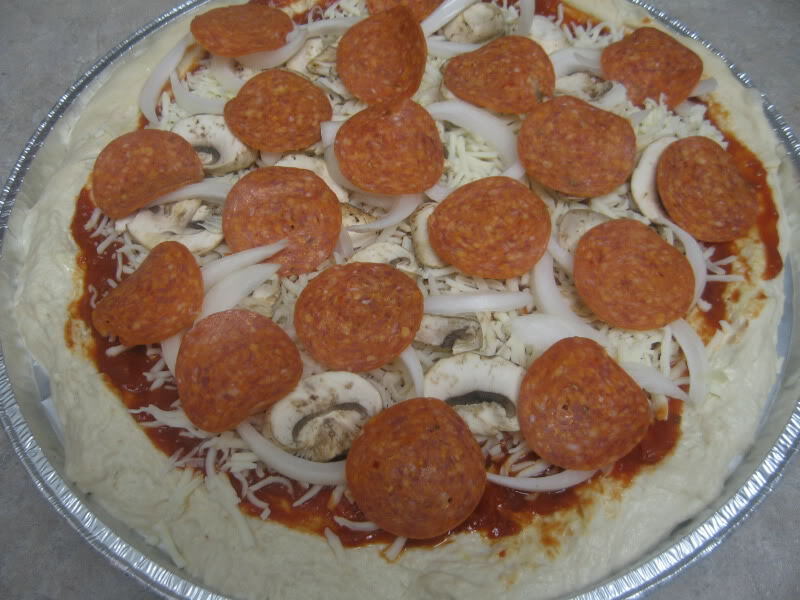 Put olive oil over the dough before any toppings. This ensures that nothing sops through the dough to make the final product mushy. Preheat the oven anywhere from 375 to 425, depending on how crispy you like your pizza. Then you're ready for your toppings. Sauce first, if you are using it. Then I put on cheese, but you can save that for last depending on your preferences. And as much or as little toppings of each kind that you desire. Cook for 20 minutes or so. You can use leftovers to make gourmet pizzas. 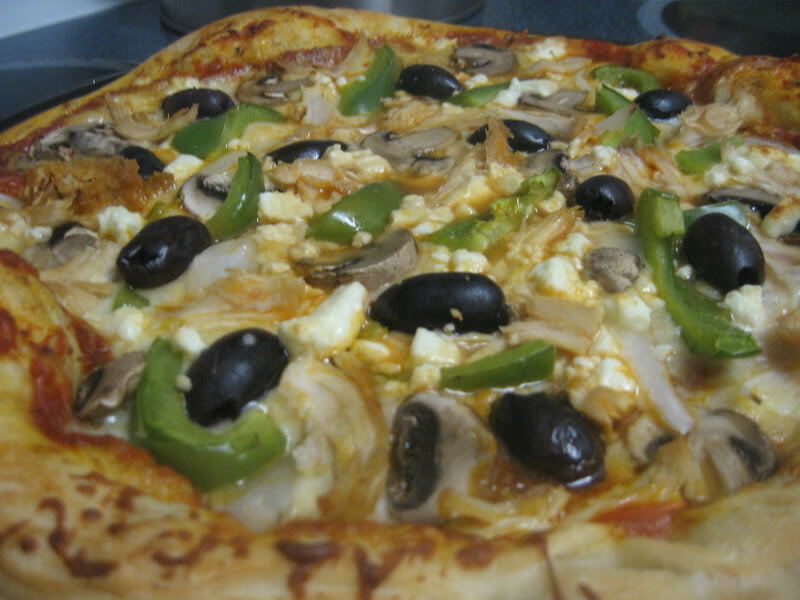 I made this greek pizza with kalamata olives, peppers, feta cheese, onions, mushrooms, and leftover chicken. It was delicious. My husband doesn't particularly like marinara sauce, so lately I've been doing a lot of white pizzas. 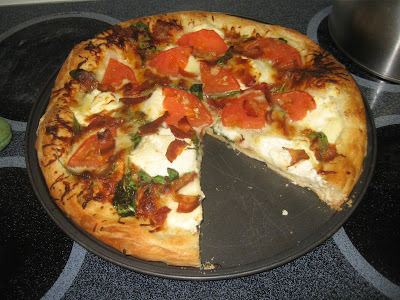 Ricotta cheese, tomatoes, basil, spinach, garlic, bacon. Any of these make for great white pizza toppings. You could also do a full veggie pizza without sauce. Bored of pizza? Split the dougj in half and make calzones. 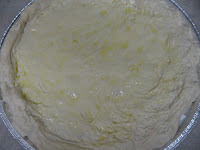 Make two small circles out of the dough. 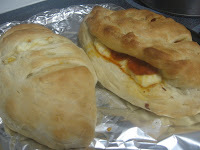 Fill with mozzarella, ricotta, pepperoni, spinach, lunch meat, whatever you'd like. Fold the dough over, and cut slits in the top to release the steam. Put them on a cookie sheet. 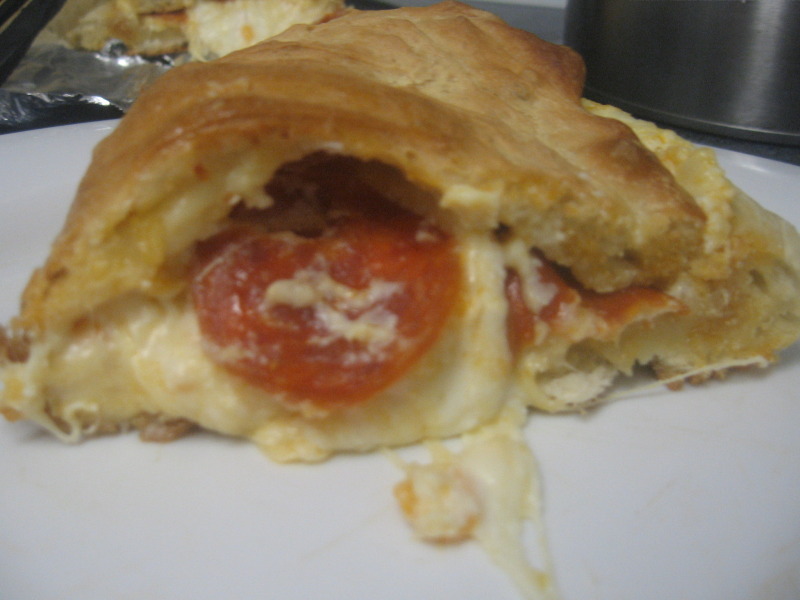 Cook it in the oven until the crust is browned. Wao! yummy dish. my all friends like it. even when we think to throw a party, we simply go to jim's home . His mother make it for us from pizza recipe . I found this post through tastespotting and made the pizza for dinner last night---it was delicious! Thanks so much for sharing.